South Korean automaker Hyundai is looking to enter the commercial vehicle space in India. Business Standard reports that the company is evaluating the small and heavy commercial vehicle market in the country. MD and CEO of Hyundai Motor India Limited (HMIL), Y K Koo confirmed the development. A team from Hyundai’s CV division visited India in June to study the market and meet potential business partners. 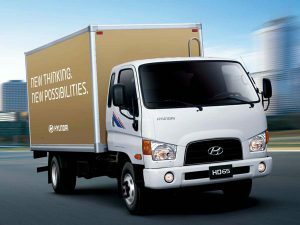 Hyundai’s existing car dealerships were also asked about their interest in selling commercial vehicles. But Koo also stated that the passenger car division would not be directly involved in this process. In December 2016, it was reported that Hyundai was keen to expand its commercial vehicle business and India was its top priority. The automaker was also looking to set up a production facility in the country. Hyundai was planning to produce commercial vehicles in India for both the domestic and export markets. Daimler India Commercial Vehicles also manufactures the BharatBenz vehicles in India for exporting and domestic sales. In India, Hyundai will join the global commercial vehicle manufacturers such as Volvo, Scania, Daimler and MAN. Hyundai is likely to enter India with a range of premium buses and trucks. Indian commercial vehicle market is dominated by domestic companies such as Tata Motors and Ashok Leyland in the HCV segment. Mahindra dominates the LCV segment. So, Hyundai might face fierce competition from the existing automakers in the country.